Wooden objects coated with lacquer, the varnish being made from the sap of the lacquer tree of China and Japan, which forms a smooth, hard surface that was often inlaid with designs., and decorative items to the United States and other countries. Tea was introduced to England and her possessions in the middle of the seventeenth century. In China, it had been known for centuries. 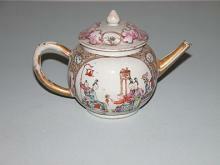 Tea played a role in world events in the 18th century, including the American Revolution. Paintings done by Chinese artists during the period of the China Trade tended to follow Western styles of portraiture. 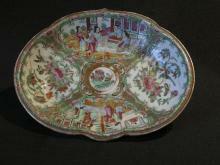 Read more and Chinese export porcelain, were made for resale in the West. 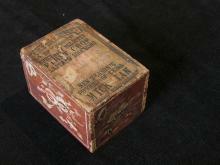 Other items were bought by merchants and sea captains for family members and friends, and for their own homes. These included furniture, sewing boxes, and clothing, not suited for resale but moderate enough in price for merchants to purchase for their own use. 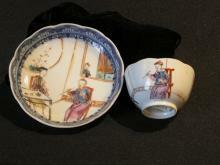 A blue and white porcelain design, introduced in England in 1780, based on a Chinese legend. It traditionally shows a house, willow trees, a bridge, and Chinese figures. depicts Chinese scenes but was actually made in England. A coarse fiber from one of two East Indian plants, used for making burlap, or mixed with hemp for rope. from Calcutta. Jute was needed for the manufacture of linoleum in New York.